The Rothman Rink and Cabin Close Sunday! 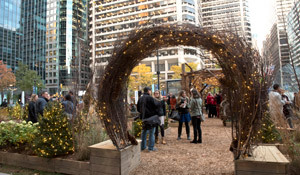 We're down to the last days of the Wintergarden at Dilworth Park! 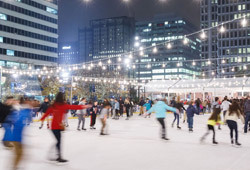 Until February 26, you can skate around the Rothman Rink, and get great food and drink in the Rothman Cabin right next to historic City Hall. The Winter Season at Dilworth Park is presented by Rothman Institute and through the generous support of Subaru, Capital One, The Philadelphia Orchestra, Temple University and 6abc. Explore the America's Garden Capital Maze on the Greenfield Lawn in Dilworth Park until February 26! Created in partnership with Greater Philadelphia Gardens, children and adults can delight in discovering picture-perfect moments amid the vibrant plantings, topiaries, twinkling lights, and décor. The maze showcases all 32 public gardens, arboreta, and historic landscapes that are located within 30 miles of Philadelphia. Made possible through the support of the William Penn Foundation. Last Chances to Get that Green Thumb Ready! Celebrate Black History Month on February 28 with The Philadelphia Inquirer, Daily News, Philly.com and WHYY at Black History Untold: Black Joy Event. Serving as the finale to a month-long series of editorial coverage, the program will convene African American community leaders to discuss happiness, from 5:30-7:45pm. Co-hosted by Philadelphia Media Network and WHYY, the event features networking over cocktails and hors d'oeuvres, live entertainment and a panel discussion co-moderated by Sofiya Ballin, features reporter, The Philadelphia Inquirer and Dr. James Peterson, Director of African Studies Department at Lehigh University and host of the WHYY podcast, The Remix. Tickets, $30 for adults and $10 for students, are available at Philly.com/blackjoyevent. Science and art come together at this year’s Paleopalooza, a weekend family festival of musical dinosaur puppetry, live animal shows of dinosaur descendants, rare dinosaur fossils, and even a look at the prehistoric sky, March 4-5, at the Academy of Natural Sciences of Drexel University. Visitors can watch as Alaskan artist Ray Troll uses chalk to recreate the famous Hadrosaurus foulkii on a giant chalkboard in the Drawn to Dinosaurs exhibit. Field Station: Dinosaurs explores the eating habits and table manners of our favorite dinosaurs in a lively interactive show of puppetry set to music. Academy paleontologist Ted Daeschler, fresh from a research expedition to Antarctica, will describe his amazing adventure and Devonian fossil finds in a fascinating presentation. The Franklin Institute Chief Astronomer Derrick Pitts will take visitors on a star-filled tour of the prehistoric sky, demonstrating what T. rex would have seen when he took a break from devouring other dinosaurs to gaze up at the sky.